Nokia 6500 Slide. phone, battery ( slightly swollen, but works), battery cover. This is used part. On sale Nokia 6500 Slide. Fully working and tested, the phone has been photographed all around so that you can see exactly what you are purchasing. The pictures are from the actual phone. Nokia 6500. Genuine Nokia product. Made in Hungary. For more photos just ask. 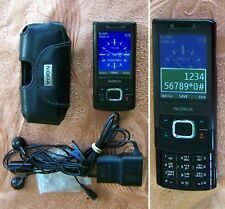 Nokia 6500 slide, prototype, fully working, unlocked, any SIM card. Carrier :See Title (the title normally stated which carrier it's with or unlocked). Warranty : RFG Warranty. We are with. for more great deals! Condition :Preowned. Nokia 6500 Slide Silicon Case in Clear White SCC4328WH. Brand New in packaging. The Case provides a non-slip surface so it is not easily dropped by accidents and misadventure. Manufacturers warranty. > 100% designed and styled in Australia to suit Australian conditions. > Improved comfort. Original NOKIA BP - 5 M battery. Original Nokia product. This battery will give new life to your phone. Full Black Cover for Nokia 6500s 6500 slide. – Flex cable. Condition: New. Comfortable genuine Nokia earphones with good quality audio provide a pleasurable listening experience. HS-83: 3,5mm standard Head Jack (3-Pins) AD-83: Micro-USB Connector (Male), 3,5 mm Standard Jack (Female) Type Headset: Stereo. Gold housing for Nokia 6500s. We hope we can avoid any unnecessary complaints or misunderstanding by a good communication with you. Full Black Cover for Nokia 6500s 6500 slide. We hope we can avoid any unnecessary complaints or misunderstanding by a good communication with you. Get to know the comfortable side of your device with this great quality horizontal holster. Constructed from a high grade PU leather your Nokia phone is positioned on its side for comfort when you put it away. Nokia 6500s Slide Shatterproof Crystal Hard Case in Clear CPC4328 by Cellink. The Case provides a non-slip surface so it is not easily dropped by accidents and misadventure. > 100% designed and styled in Australia to suit Australian conditions.